Some of you maybe don’t know us, so we’d like to introduce you the game we’re working on. 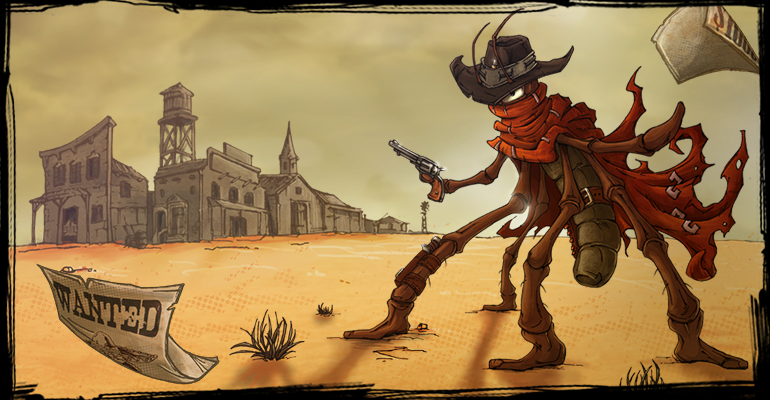 Blood will be Spilled is a spaghetti western-themed 2D action platformer taking place in a world inhabited by insects. You follow the story of Jack, a mosquito gunslinger, on his quest for revenge. We took inspiration from games we love, like Shank, Rayman Legends or Guacamelee! and also from movies by Sergio Leone, Quentin Tarantino or Robert Rodriguez. It is our first game and we are still quite early in development. In november 2014, we released our reveal teaser trailer that debuted on Game Developers Session in Prague, Czech republic. In January 2015 we’ve shown our first playable prototype on Central European Game Conference in Vienna, Austria during it’s Indie Expo. Right now we are working on the development of our first public playable demo that should serve as a proof of concept of our major features and target game mood/atmosphere. If you like our game, or have any feedback, please let us know. We have still quite a long road before us. If you want to see how this story of blood, bounties, revenge and chitin plays out, be sure to follow out progress on facebook, twitter or visit our website.